One of our favorite things about risottos is that they can breathe new life into otherwise ordinary ingredients. 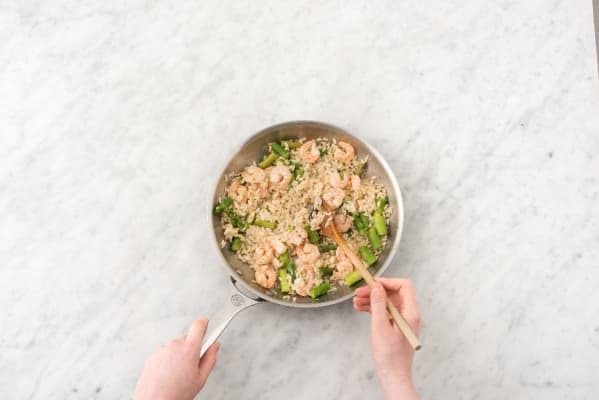 Like shrimp and asparagus, which in any other context might seem like the start of a crisp salad or stir-fry, but here become cozy, warm, and tender when folded into the oozy grains. To freshen things up, we’re adding a dash of Meyer lemon, the hybrid citrus fruit that’s part orange, part lemon, and all tangy deliciousness. Wash and dry all produce. Bring 4 cups water and stock concentrate to a simmer in a small pot over mediumlow heat. Meanwhile, trim and discard bottom inch from asparagus, then cut stalks into 1-inch pieces. Halve and peel onion. Finely chop one half (save other for another use). Mince garlic. Zest, then halve lemon. Heat a drizzle of olive oil in a large pan over medium heat. Add onion and cook, stirring, until soft, about 5 minutes. Add half the garlic and cook, stirring, until fragrant, another 30 seconds. 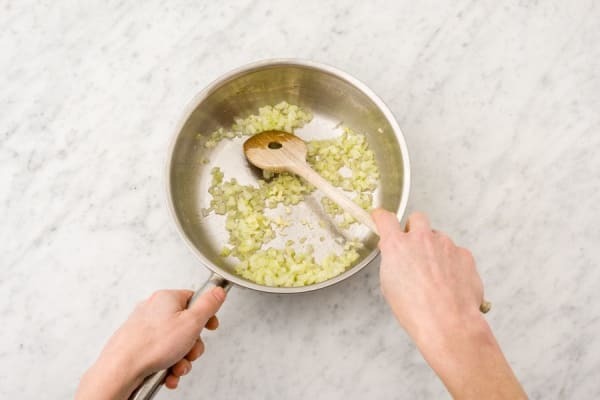 While onion cooks, fill a medium bowl with ice water. Lower asparagus into simmering stock. Cook until bright green, about 1 minute. 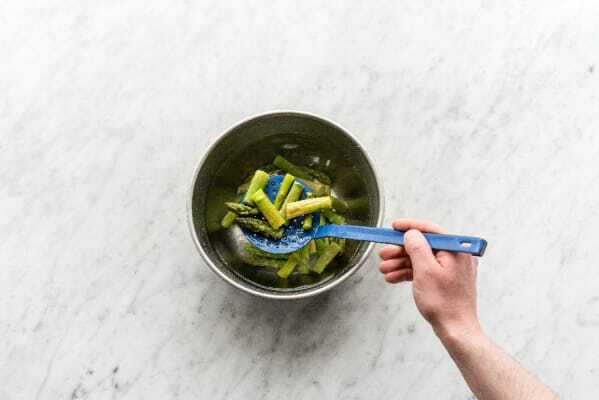 Remove with a slotted spoon (keeping stock over medium-low heat) and transfer to bowl with ice water. Let cool, then drain. Add rice to pan with onion. Cook, stirring, until grains are translucent. Add stock ½ cup at a time, stirring after each addition. Allow rice to absorb most of stock before adding more. Continue until grains are al dente and creamy, 25-30 minutes. Heat a drizzle of olive oil in a medium pan over medium heat. Pat shrimp dry with a paper towel. Add shrimp, remaining garlic, and asparagus. 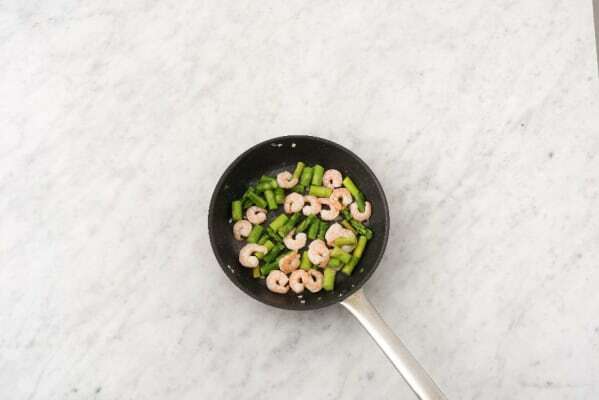 Cook, tossing, until shrimp are opaque, 3-4 minutes. Season with salt and pepper. 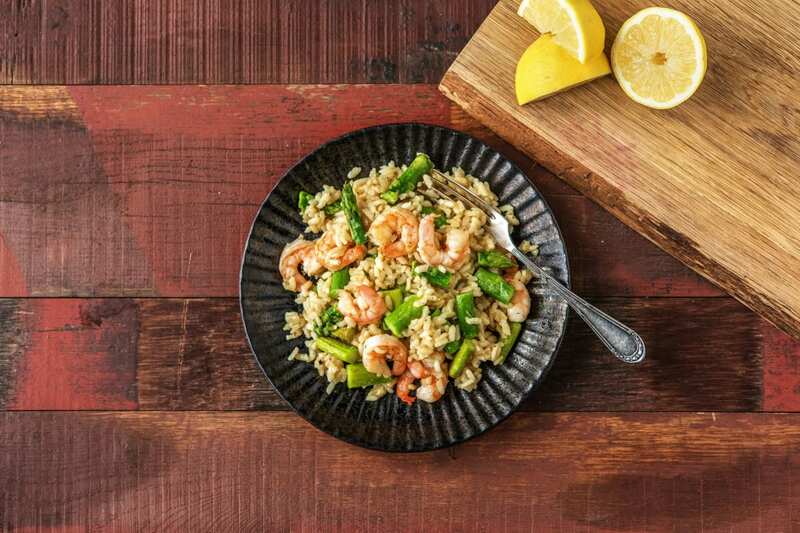 When risotto is done cooking, stir in shrimp mixture, a pinch of lemon zest, half the Parmesan, and 1 TBSP butter. 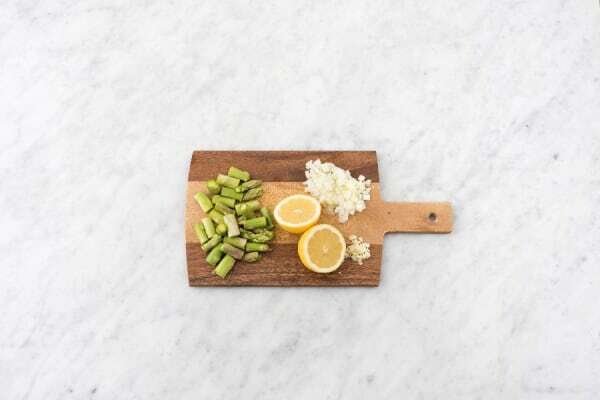 Season with salt, pepper, and a squeeze of lemon. Divide risotto between plates. 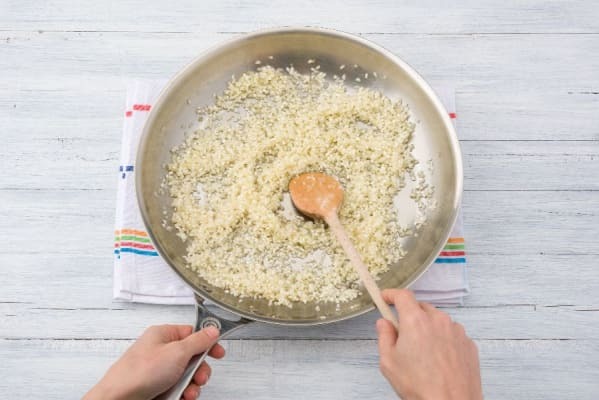 Sprinkle with remaining Parmesan and serve.